The game is played on a volleyball court 18 meters long and 9 meters wide, divided into two 9 m × 9 m halves by a one-meter wide net placed so that the top of the net is 2.43 meters above the center of the court for men's competition, and 2.24 meters for women's competition (these heights are varied for veterans and junior competitions). Preparation of strong and reliable base is a must for the construction of a synthetic hard court. Volleyball Court Construction can be done in different surfaces depending on level of players and budget. We also provide chain link fencing, lighting and storm water system in the court. We are a company which is well known in the market for the supply of various products and various kinds of services we offer to the customers such as the Volleyball Court which we offer to the customers and the work is carried out as per the quality parameters set by the industry and it is done as per the specifications given by the customers. They have been priced at very reasonable rates in the market and they are offered to the customers on time. We are industry leading manufacturer and supplier of Wooden Volleyball Court to our clients, having technically advanced features and sophisticated look. 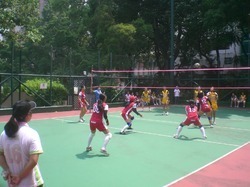 Our Volleyball Court is widely demanded by schools, clubs, sports organizations, and so forth. 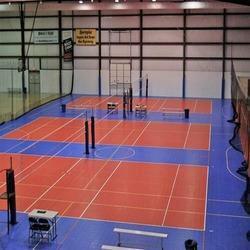 We provide Volleyball Court that is designed as per the latest demands of sport industry. 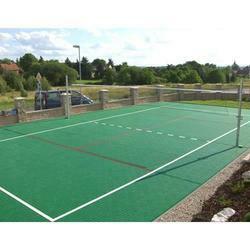 These courts are available at industry leading price. Exclusive use of Bona Polish that is Anti Skid and DIN approved. We make available Synthetic Volleyball Court to our prestigious client, thats used in Clubs, Schools, Gymkhanas, Hotels, Armed Forces Recreation Centers, Stadiums, Universities, etc. We offer this product at very reasonable price and commited to deliver before schedule time. 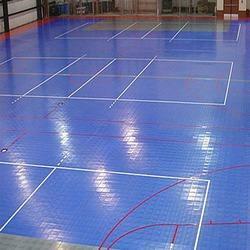 We are recognized as a dependable Volleyball Court Supplier in India.